The rupee fell 46 paise to close at 72.97 level, its lowest ever against the US dollar in trade today which dampened market sentiment. The Indian currency had closed at 72.51 to the dollar on Monday. Led by the sharp fall in stocks, the market capitalisation (m-cap) of BSE-listed companies plunged by Rs 2,72,549.15 crore to Rs 1,53,64,470 crore since Friday. The Sensex closed at an over month low on hectic selling in realty, PSU, power and banking counters amid rising trade tariff tensions between the US and China and weakness in the rupee. While the Sensex tumbled by about 295 points to close at an over one-month low of 37,290, Nifty closed 98 points, or 0.87 per cent lower, to end at 11,278. During the session, it moved between 11,411 and 11,268. "Selling pressure increased on the bourses due to spike in oil prices," said Vinod Nair, Head of Research at Geojit Financial Services. Flaring up of trade tariff tensions between the US and China and weakness in the rupee have also added to weak investor sentiment. Market sentiments were further dampened after US President Donald Trump on Monday announced imposition of new tariffs on an additional $200 billion worth of imports from China, escalating the trade war with the Asian giant. Alleging that China has been unwilling to change its unfair trade practices, Trump said the new additional tariff structure would be effective September 24 from when it would be at 10 per cent until the year end, but would increase to 25 per cent level from January 1. The 30-share Sensex opened on a somewhat better note at 37,660 and advanced to touch a high of 37,745 but turned choppy and hit a low of 37,242 as selling pressure gathered momentum towards the fag-end, before settling 294 points, or 0.78 per cent, down at 37,290. This is the lowest closing since August 2 when it had settled at 37,165. It had lost 505 points on Monday as rupee woes and trade war worries spooked investors despite the government announcing measures to stem a steep fall in the domestic currency. VK Sharma, Head, Private Client Group & Capital Market Strategy at HDFC Securities said, "Trade war fears, rising crude oil prices and depreciating currency put pressure on the markets, Nifty fell almost a percent today and has lost 4% from its recent highs. The government's surprise move to merge three public sector lenders - Bank of Baroda, Dena Bank and Vijaya Bank resulted in frantic activity in markets. BOB shares fell 16% and lost Rs 5,700 crore of its market capitalisation. Dena Bank stocks went 20% up today. " 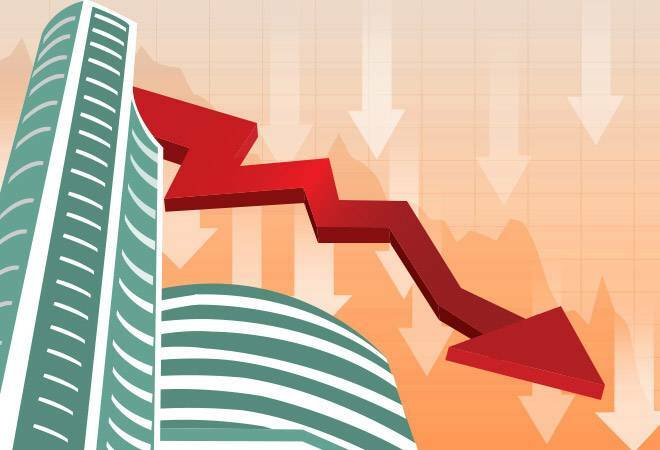 The Bank of Baroda (BoB) stock plunged today a day after the government announced the bank's merger with other public sector lenders Dena Bank and Vijaya Bank. The stock closed 17.04% or 23 points lower on the NSE. On the BSE, the stock closed 16.03% or 21 points lower at 113 level. The market capitalisation of the stock fell by Rs 5,727 crore to Rs 30,013 crore on the BSE. The M-cap of the bank stood at Rs 35,740 crore when market closed yesterday. Top Sensex losers were SBI (4.06%), Tata Motors (3.36%) and Bajaj Auto (2.84%). Of 30 Sensex stocks, 23 closed in the red. HUL (3.87%), YES Bank (1.43%) and Wipro (1.02%) were the top Sensex gainers. Market breadth was negative with 869 stocks closing higher compared with 1826 falling on the BSE. Domestic institutional investors (DIIs) sold shares worth Rs 180.36 crore, while foreign portfolio investors (FPIs) also offloaded shares to the tune of Rs 106.54 crore on Monday, provisional data showed. Global stock markets, particularly those in Asia, shrugged off the widely anticipated announcement of further US tariffs on Chinese goods. Japan's Nikkei 225, reopening after a national holiday, jumped 1.4 percent to 23,420. The Kospi in South Korea added 0.3 percent to 2,308. Hong Kong's Hang Seng index rose 0.6 percent to 27,084. The Shanghai Composite index rebounded 1.8 percent to 2,699. But Australia's S&P/ASX 200 shed 0.4 percent to 6,161. Following big gains in Asia, such as a 1.4 percent increase in Japan's Nikkei 225 stock average, the rebound stalled in Europe. France's CAC 40 added 0.2 percent to 5,361, while the DAX in Germany rose 0.2 percent to 12,119. Britain's FTSE 100 was steady at 7,303. Wall Street was set for modest gains at the open too, with Dow futures and the S&P 500 up 0.2 percent.